We have been using this tagline a lot over the past year and a half. It sums up some important pieces of our mission and vision statements in a very concise way. So it is a great one liner to put on our brochures, signs and website. Welcome is about greeting and receiving someone with kindness and pleasure. That is, welcome is about treating other people well. That is, welcome is about treating others as you would want to be treated. That is, welcome is about treating others as valuable human beings. And welcoming other people is a core idea throughout scripture. 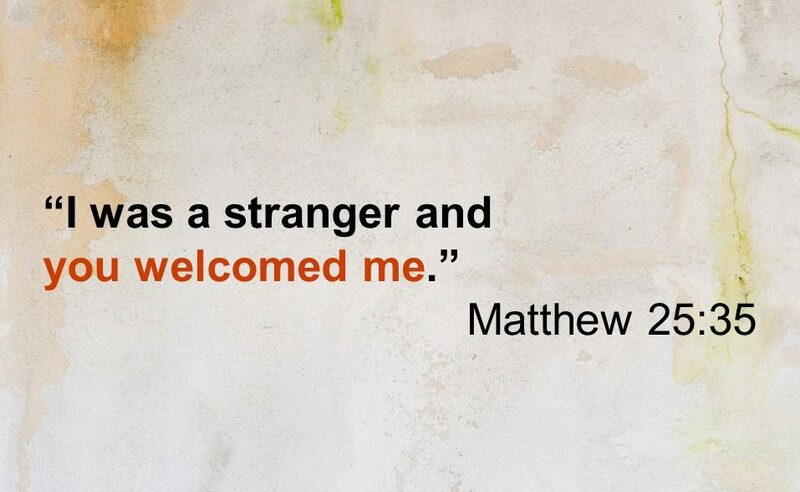 The Hebrew Bible (or Old testament) speaks of welcoming the stranger quite often (eg. Leviticus 19:33-34, Deuteronomy 10:19, Proverbs 5:10, Job 31:32, Isaiah 58:6-7). The New Testament does as well (eg. Matthew 25:35, Luke 6:27-36, Hebrews 13:1-2, Romans 12:13, 3 John 1:5. Welcome is a core message of the Bible. Welcome is a central practice of both Christians and Jews alike. Welcoming other people is a divine mandate. No one is excluded from welcome. The way we welcome others is connected to the way we welcome the divine. And that brings me back to our church tagline: God welcomes everyone…and so do we. This simple statement recognizes and honors the centrality and importance of welcome for Christians. It sends a message to our surrounding community that speaks to who we are as a church family. And it is a reminder for every person in our family of faith. This Sunday, our new Freeway series will launch by looking at a key story of welcome in the Bible: The Prodigal Son. The story is about a father whose love is so strong that he graciously welcomes home his son who rebelled, left home, and chased other things. It is a paradigmatic moment of welcome in the teachings of Jesus. And we will explore the welcoming invitation that God has for each of us that is represented and symbolized by the prodigal sons’s father. My prayer is that God’s message of welcome will change us and transform us every day in every aspect of our daily lives so that the way we welcome others will be a strong and clear and beautiful witness to God’s love and grace.